Having spent a lot of her career in theatre, Jemma knows the demands a busy lifestyle can have on dog owners, especially those who want to find time to train their beloved pups, but can’t find a trainer who will work around them. With that in mind, Jemma offers her clients round the clock appointments that fit in with their busy schedule. 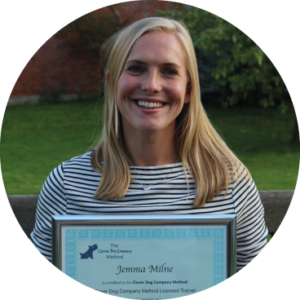 Offering 1-1 sessions for owners with puppies and dogs in South East London, Jemma has realised and made her passion for dogs become her full-time focus, and she’s certainly well-placed to help owners who need that all important flexibility in their lives. Copyright 2016 © Clever Dog Company, All Rights Reserved.